I'm sitting a couple blocks from the National Archives sipping a particularly peppery chai at a place called Teaism. I seem to end up Starbucks often enough on trips, it's nice to be someplace a little different, even if they don't seem to have wireless (fortunately I'm packing my own). The National Archives were interesting. Maybe not as amazing and awe inspiring as the first time I walked out onto the Capitol Mall and touched the Washington Monument, but still and amazing place to be. They have a corny exhibit with some authentic documents and audio/video presentations (I think Teddy Roosevelt was hyper active, and I had no idea he had such a high voice); it was nice, but reminded me of the ride that has replaced touring the Hershey's plant in Pennsylvania. 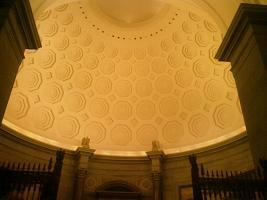 But the rotunda is history. Dark, reverent, kind of like going to church. They have a range of documents which form the basis of our free society (with the Magna Carta out in the foyer). 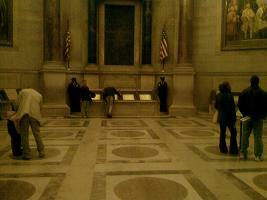 The original Declaration of Independence is nearly illegible, which apparently started almost immediately. 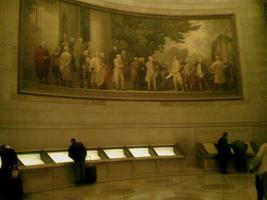 Any image of the Declaration you've seen is a copy of the print made from a hand carved copper plate in 1824. 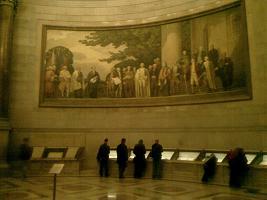 But that muddy bit of parchment under glass in the rotunda is still the real deal. I was also surprised that the Constitution is four, large sheets of paper, also fading. I don't know why it surprised me, I've seen pictures in books, but it did. I suppose I get it confused with the Declaration, like any good American would. I didn't ask the bored (yet somehow irritated) looking guards if the movie National Treasure was accurate in that when the close the documents slide into a vault below, but it looked like it might actually be true -- looked like they had lasers and everything inside those dark glass cabinets. Terrible that I think of such an awful movie in such an incredible place. I don't know that Roosevelt had that high a voice. That's just how recordings sounded in those days.